The Challenge has ended, though there are a few less finished maps than expected. If you think you may enter but are unsure, I urge you to do it anyways. Some people might not think they can finish in time, but they can still try. You may get noticed for even a partial map. After a long wait, us crazy people (and the few remaining sane ones) over at QMC are running another event. Your goal is to create a Complete map, which is visually appealing and Fun To Play in 30 days. proper lighting and texturing and adequate map details, to keep people interested. We are allowing solo entries and teams of two. following the layout stated in the Application Template thread. There is additional information in the same page as well. officially start on April 16th and run for 30 days. The other contest was extremely limited. This one is very open. You could make an unbelievably huge map, or a tiny map if you want to. The deciding factor is whether people like it. We'd like to emphasize on layout and game-play on this one, mainly. The 30 days allows people to manage their time. The average mapper can easily make a map in 30 days, and edit 1 to 2 hours a day. If you edit 2 hours a day, thats 60 hours over the month, which is more than enough for the average map built with this engine. Besides, with a contest or challenge you need to draw the line somewhere. The "Seven Hundred Thirty Day Mapping Challenge!" Would give everybody enough time, but then it's not challenge anymore. If you feel like you'd be cutting it close, enter anyways. It's good practice. Honestly, that's why I don't see this one being very exiting. Many competitions have a theme (more than just a game mode) or more interesting limitations. The only limitation is the 30 day time frame, which isn't very notable at all. Of course you want to make the map everyone likes the most, but otherwise this is just (hypothetically) taking maps within this time frame from quad from authors who signed up and have not co-oped with more than one other person. I should note, that no matter what kind of event you run, there will always be people who don't like it. One person will complain there is not enough time, another will complain that the rules are too limiting, or in other cases that they allow too much. One cannot please everybody at once. Now, about this one. We are looking for a Complete map, with emphasis on a good layout. A good layout means that it is interesting, self supporting, gives a degree of freedom of choice to the player, and is fluid. Fun to play and fun to navigate. The map needs to have a smart weapon and pickup layout as well, which should complement the physical layout. Besides that, you need the map to be Visually Appealing. This meaning it needs to be Properly textured and lit, with adequate geometric detail. Making a *good* map for most people is not the easiest thing they've ever done, and for quality, anybody can make four towers, connect them, slap on a few textures, set a skylight and call it a map. It's not going to get them anywhere though, now is it? If you're up for it, I urge you to try your hand. This is freedom of creation. Personally i see this as a tool to motivate good maps in cube. Im excited to see the contest and too see the maps and the progress overtime of these maps. Im also excited to see the final product to declare a winner. But what makes me most excited is the fact at the end we will have 4 or 5 (at least) good maps. I think the biggest downfall from the last contest is that we had 5 maps (i do believe we had 5 entries) that were layout wise identical, so really it was no more the theme preference. I think this contest will generate some good maps! I was signed up either for that contest, but couldn't find any time neither inspiration to create something of that template map :S.
As for inspiration, It can be very hard to find good inspiration, but you need to keep in mind, inspiration rarely just appears. It comes from doing. So sit back, start building, and perhaps a noble idea with present itself. As an example for the entry I submitted for the last contest, I started off by making that beveled arch in the basement area. That was the first thing I built, and the rest of the map stemmed from that. Just to clarify on what Jake said, the aesthetics of the map are not the main concern here. Your mission is to create a map with a fluid, well thought gameplay and elaborate on it. You don't need to go Picasso in terms of lighting and texturing, but we ask that you don't deliver a white deconstructed blob. 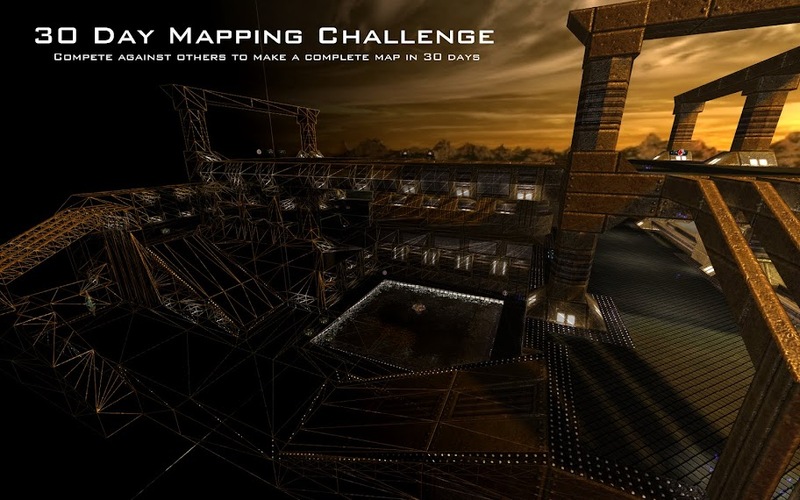 The challenge has officially started, mappers have until May 17th to build their maps. We don't care of your age, gender, language, where you live, or how good at editing you think you are. ;) If you want to enter you can, and we would love to have you. I am in snowys team. I remember some cooking show my aunt watched where the chefs were given 3 completely random things as a theme, and they had to work all of them into their creation, and then explain to the judges how they implemented each thing, and how it is symbolized or whatnot, maybe if you were to do another contest, you could try it along those lines. Yes indeed. Anybody can start such. Really? I check that forum all the time, I mean, I was just there what 3, maybe 4 weeks ago. I see you are as regular as me. Congrats. Perhaps you should be promoted to an admin. Oh no, it's for real. They already gave me the keys to the executive washroom. Now that I'm in charge over there, expect some real changes.